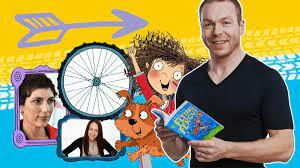 Sir Chris Hoy chats about his new book Flying Fergus with Dan! Listen from 3:30pm on Tuesday 27th! Dan’s had a very special guest on his show – Sir Chris Hoy! Cycling champ Sir Chris Hoy is one of Britain’s most successful Olympians ever having won six gold medals! Plus, because he’s a ‘Sir’ he’s a real-life knight. Sir Chris is also the creator of the Flying Fergus books and, ahead of World Book Day this Thursday, Dan finds out more about the series. He’s joined by writer Joanna Nadin and illustrator Clare Elsom who have worked with Sir Chris to create the Flying Fergus books! There are seven books so far with the eighth coming out on March 1st! That’s called Flying Fergus: Trouble on the Track. In it, the International Championships are just around the corner, and it’s time to name the four riders who will be in the starting line-up. The coaches decide the only fair thing to do is hold official trials to decide who’s in – and who’s out. It’s neck and neck for Fergus and Daisy and with just one race to go, tensions in the teams are riding high!